The 3-in-1 trading account gives you the convenience of opening a demat, trading & bank account. Trade in Shares, Futures & Options, Currencies, invest in Mutual Funds, IPOs and Life Insurance through our seamless and secure 3-in-1 online trading account. Your demat account is seamlessly linked to your trading and bank accounts. Demat Account opening charges are free, annual service charges for the first year is NIL. In a single platform, you can manage your online trading account as well as savings account. Hence, you keep on earning 3.5% interest on the allocated unutilized amount for trading. Buy or Sell shares worth ₹ 44# Lakhs without paying brokerage in the equity cash market. You can trade in shares both on NSE and BSE, Futures & Options, Currencies and invest in Mutual Funds, IPOs and Life Insurance through our online trading platform. Also avail leverage plans like - Margin, MarginPLUS. eATM or Equity ATM, is a pathbreaking feature, that lets you receive money, into your bank account on selling your shares in an instant! Get up to ₹ 50,000*** credited to your bank account, within 30 minutes, on sale of over 600 BSE stocks without any extra cost! Our brokerage includes DP charges of higher of 0.04% or ₹ 25 every time shares are debited from your demat account. This is commonly charged by brokers but not by ICICIdirect. You can also choose from our various pricing schemes, tailored to your investing or trading habits and enjoy low brokerage charges. Our advice is categorised based on risk, return and time horizon of investments, with over 200 companies covered across multiple sectors we cover the depth and width of the market. We are at your service with just a click. Our expert will call you for any assistance with respect to queries on your trading account at your convenience. You get access to a Dedicated Call Centre which is operational from 8:30 a.m. to 6:00 p.m.
ICICIdirect.com web site is simple & easy, and their relationship and service advisors are knowledgeable and friendly… I like the direct linkage to my bank savings account so funds transfer are automatic and a breeze! 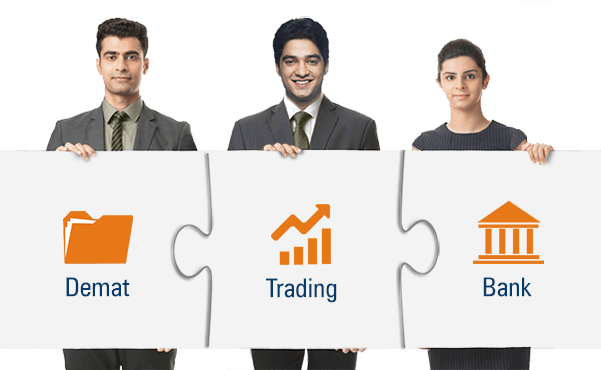 ICICIdirect has a robust trading platform and their USP being trading for beginners to Professionals….they also provides learning class room to educate clients at various levels of trading and enhance their knowledge on research, which again is not done by any other player in the market. Trade Racer is a trading platform which provides you with Live streaming quotes & Research Calls, integrated fund transfer system along with multiple watch list facility. Power-packed with new features, Trade Racer gives you the power to identify market opportunities while enjoying the attractive new look and feel of the trading terminal. **The 3-in-1 account is a joint offering by ICICI Bank Ltd. and ICICI Securities Ltd. that integrates the Trading account (maintained with ICICI Securities Ltd.), Bank account (maintained with ICICI Bank Ltd) and beneficiary demat account (maintained with ICICI Bank Ltd in its capacity as a Depository Participant). In case you are not in above category you can still open your account @ ₹ 0/- where this Offer is only for Salaried Customers. Initial account opening charges will be refunded against your brokerage in T+1 month subject to trade. T being the account opening month. The minimum balance in your savings account will be as per ICICI Bank's discretion. ***eATM which stands for Equity ATM is a facility offered by ICICIdirect (ICICI Securities Ltd) wherein customer would receive credit of funds within 30 minutes (as against the current payout cycle of T+2) from the time of execution of sell order in cash segment. Such eATM orders will be permitted up to ₹ 50,000/- per customer per day for eligible securities on Bombay Stock Exchange. Please note that intervals at which payout of funds will be made and the maximum amount per customer that will be paid during the day will be at the sole discretion of ICICI Securities Ltd.